Navigate to www.securedsigning.com and click the Secured Login In tab on the top-right of the page. Fill out your login details and click Login. Once you log in you should arrive at the Inbox on the My Documents page. Click the Add New Document button to show the document uploader. Click Browse to find and select the document you wish to sign. 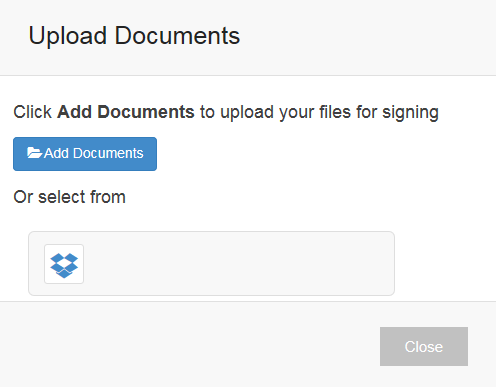 Click Upload to add the document to your Secured Signing workspace. After successfully adding the document it will appear in your My Documents Inbox. 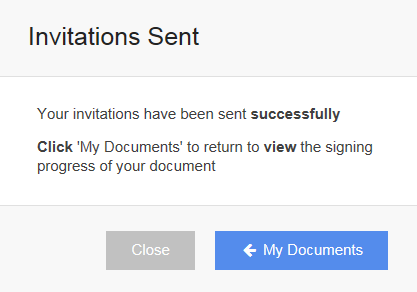 Click Invite other to sign icon on the document you wish to invite people to sign (My Documents Inbox). You will be taken straight to the Console and begin the We Sign process. The console shows a preview of your document and allows you to place signature blocks in an easy-to-use design environment. In the signature blocks can be for Invitees or Witnesses of the signing. Tip: You can navigate within your document by clicking the thumbnail-preview pages to the right or select a page from the page drop-down menu on the top. 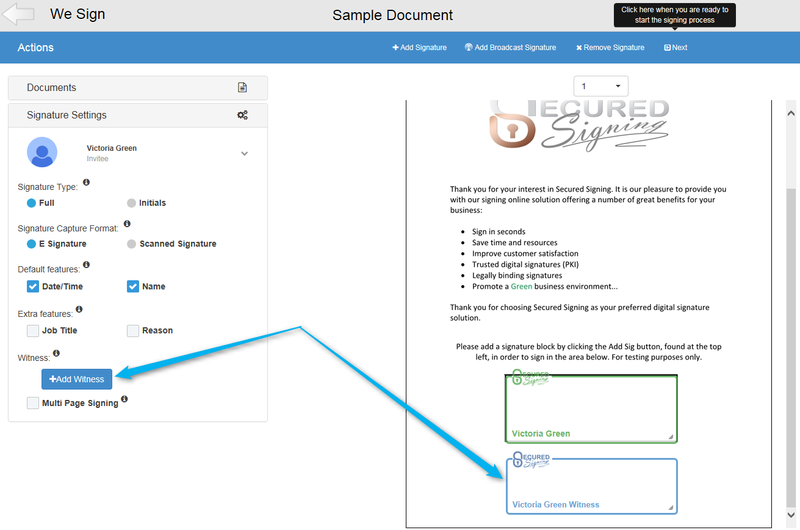 Click Add Sig to add a signature to your document. You'll need to click "+Add Witness" as one of the settings in the signature setting. With the Witness option the Invitee will be prompted to invite their own Witness to sign the document. Enter the details of the person who is signing the document. An e-mail invitation will be sent to the e-mail address you provide so be sure it is correct! Select between a full-signature or initials. Selecting Initials is much like initialling a paper document. When you set up your graphical signature you must provide both a full signature and your initials. Specify whether the Invitee can use an E Signature or a scanned signature. An E Signature, whilst still legally binding, can be captured using any of Secured Signings signature capture processes. A scanned signature, however, must be a digital copy of your real signature. Some organisations require signatures to be visibly consistent with a traditional hand-written signature so they can compare how it looks to their copy on file. Include the Invitee's Job Title with the signature. Prompt the Invitee to provide a reason for signing to embed in to the signature. Allow the Invitee to sign multiple pages. You specify which pages the Invitee can sign; All pages, odd pages, even pages or select specific pages. 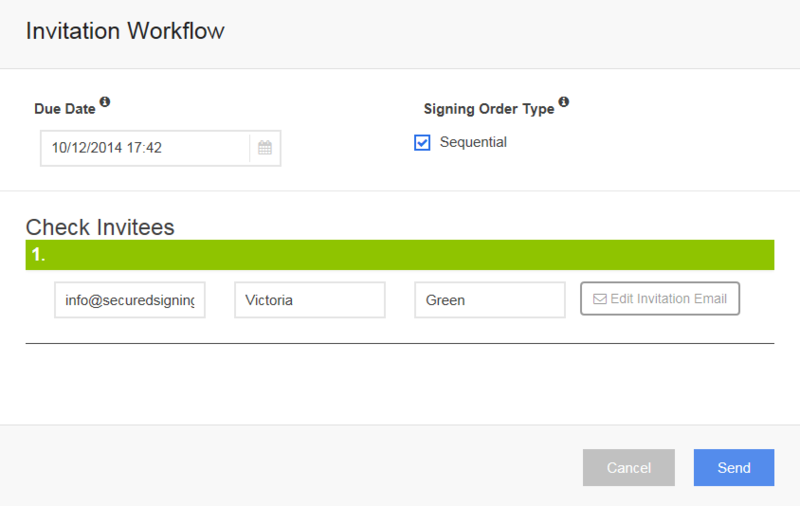 Click Next to open the signatories workflow popup and prepare the signing procedure. Here you can define a specific signing order, set a signing due date / time, change the details of the invitees and create custom messages to send with the invitation emails. 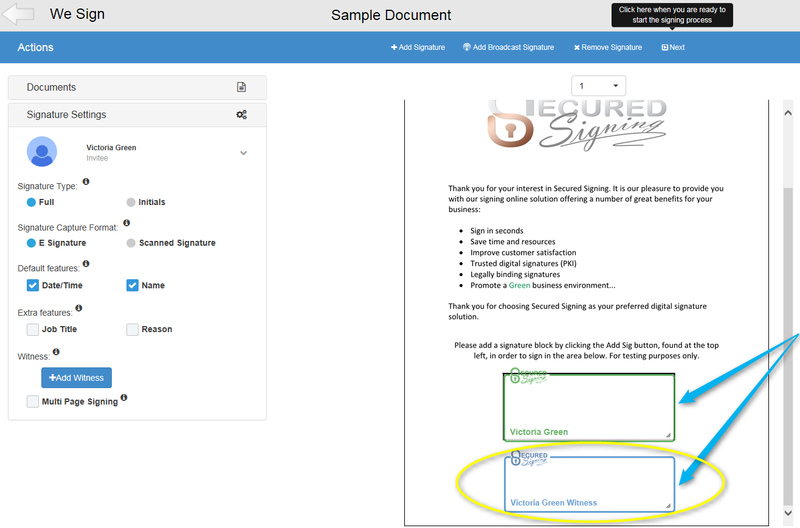 Your document now appears in your 'In Progress' folder on the My Documentspage so you can view who has signed, and who is yet to sign. When all Invitees have signed you will be sent a confirmation email and the document will be moved to your Signed Folder.